It was 10 minutes into the third period and the hometown Blazers were trailing the Kelowna Rockets 2-0 in a game that Kamloops needed to win if it was to stay alive in these playoffs. F Deven Sideroff of the Blazers parked himself in front of Kelowna G Michael Herringer, then got his raised stick on a point shot and deflected it into the net. The call on the ice was a goal, so when it went to video review conclusive evidence showing Sideroff’s stick above the cross-bar when contact with the puck was made would have been needed to overturn it. The replays shown on the big screen on the scoreclock certainly were inconclusive, so we have to assume that the video review official had a better quality picture or a different angle because the goal was disallowed. The Rockets went on to end the series, thanks to a 4-2 victory. WHL commissioner Ron Robison in video-replay room discussing Sideroff call to come with off-ice officials. Not sure what protocol is there. “When it’s a goal on the ice, you usually have to have pretty conclusive evidence to (overturn) it. Like I said (Sunday) night, when you play Kelowna, you’re not going to get that call. “The commissioner is in the building. He’s up in that room. You know as soon as he goes up there, you’re not going to get it. Ron Robison, the WHL commissioner, was in the building and, apparently, visited the video review booth at the time of the Sideroff non-goal. Bruce Hamilton, the Rockets’ owner, governor, president and general manager who is the WHL’s chairman of the board, also was in the house. No, he didn’t visit the video review booth. The B.C. Division had four teams in the playoffs when the first round started. The Kelowna Rockets are the only one left standing. . . . Last night, the Portland Winterhawks eliminated the Prince George Cougars, who had finished atop the division, winning the franchise’s first pennant since it relocated from Victoria over the summer of 1994. . . . The second-place Rockets, of course, knocked the third-place Blazers from the post-season on Sunday. . . . Also on Sunday, the Everett Silvertips took out the fourth-place Victoria Royals, although it took five OT periods in what was the longest game in CHL history. The Royals had qualified for the playoffs in the Western Conference’s second wild-card spot. F Garrett Pilon of the Kamloops Blazers will be joining the Hershey Bears, the AHL affiliate of the NHL’s Washington Capitals. The Capitals selected Pilon in the third round of the NHL’s 2016 draft and signed him to a three-year entry-level contract last week. Pilon, whose Blazers were eliminated from the WHL playoffs on Sunday night, had 65 points, 20 of them goals, in 67 games this season. . . . Pilon will turn 19 on April 13, so will have to play next season with the Capitals or the Blazers; he isn’t eligible to start next season in Hershey. D Jake Bean of the Calgary Hitmen has joined the Charlotte Checkers, the AHL affiliate of the NHL’s Carolina Hurricanes. Carolina selected Bean with the 13th overall pick of the 2016 NHL draft. . . . Bean had 45 points, including 37 assists, in 43 regular-season games this season. He missed a good chunk of the early part of the season with a hand injury, returning in time to play for Canada at the World Junior Championship. . . . Next season, Bean will be 19 and will have to play with the Hurricanes or be returned to the Hitmen. Three WHLers were among the first players added to the Canadian team that will play in the IIHF U-18 World Championship in Poprad and Spisska Nova Ves, Slovakia, April 13-23. . . . F Jaret Anderson-Dolan of the Spokane Chiefs, F Stelio Mattheos of the Brandon Whet Kings and G Ian Scott of the Prince Albert Raiders are in Etobicoke, Ont., this week for a brief training camp before the team leaves for Slovakia on Wednesday, where it will play a pair of exhibition games. . . . As well, D Ty Smith of the Chiefs was invited to the training camp as an under-aged player in order to allow him to gain more international experience. . . . Canada will play Russia on Sunday in Bratislava and Switzerland on Monday in Piestany before opening the tournament against Latvia on April 13. . . . Steve Hamilton, the head coach of the Edmonton Oil Kings, is an assistant coach with Canada. Neate Sager, who freelances junior hockey pieces for Sportsnet, takes a look right here at Sunday’s marathon between the Everett Silvertips and host Victoria Royals, and he does it by the numbers. He also takes a look at some other CHL goings-on. 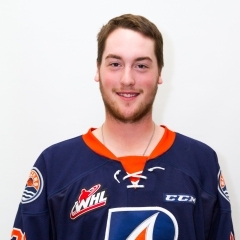 F Calvin Spencer of the Vancouver Giants has signed with the ECHL’s Tulsa Oilers. He split this season between the Swift Current Broncos and the Giants, putting up 29 points, including 16 goals, in 66 games. 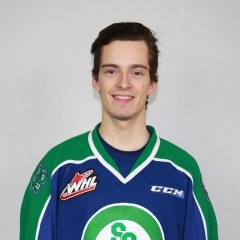 Spencer, who turned 21 on Feb. 29, played four seasons in the WHL, the first two with the Seattle Thunderbirds. In 230 regular-season games, the native of Brooklyn Park, Minn., had 66 points, including 32 goals. The Red Deer Rebels will be without F Evan Polei for Game 7 against the host Lethbridge Hurricanes tonight (Tuesday). Polei has been given a TBD suspension after he incurred a headshot major and game misconduct for a hit on Lethbridge F Tanner Nagel in Game 5 on Sunday. . . . Meanwhile, Red Deer D Alex Alexeyev skated Monday for the first time since having knee surgery in early February. He won’t play tonight but you can bet his presence gave his teammates a lift. . . . After a 4-1 loss to the visiting Hurricanes on Sunday, Brent Sutter, Red Deer’s owner, GM and head coach, told reporters: “You guys thought the Lethbridge Hurricanes were going to beat the Red Deer Rebels 4-0, because they had 20-some more points in the standings. “Our kids have played hard in this series. At the start of the series, if you’d have said we got to play to Game 7 against this team in their home building, we would take it.” . . . The conclusion of Game 7 will signal the end of the first round. The BCHL’s Nanaimo Clippers are staying put and, in fact, the future looks good with a move underway to turn the team into a community-owned franchise. At a news conference on Monday, it was revealed that the process has begun to form the Nanaimo Clippers Hockey Society. . . . Greg Sakaki of the Nanaimo News-Bulletin writes: “Keeping the Clippers in the Harbour City involved a group of individuals contributing at least $50,000 each to allow the society to purchase a portion of the hockey club. There was sufficient commitment to satisfy the current ownership group.” . . . Sakaki’s story is right here. The OHL’s Niagara IceDogs have signed head coach Dave Bell to a three-year extension. Bell just completed his first season as head coach, after spending three seasons on staff as an assistant coach. The IceDogs finished 23-35-10 this season, good for eighth spot in the 10-team Eastern Conference. They were swept from a first-round series by the Peterborough Petes. Should be noted that Portland getting blasted 7-1 in the reg season finale by non-playoff Spokane led to them playing PG instead of Seattle. series, 4-2. They had finished fourth in the U.S. Division, at 40-28-4. The Cougars won the B.C. Division pennant, at 45-21-6. . . . The Winterhawks next will face the Kelowna Rockets, who eliminated the Kamloops Blazers, 4-2, on Sunday night. This will be the fifth playoff meeting between these teams since 2011. . . . 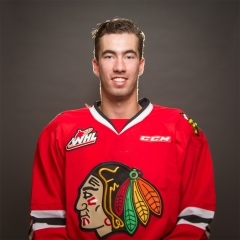 The Winterhawks and Rockets will get started in Kelowna on Friday night. . . . Last night, the Winterhawks scored the game’s first three goals, all in the second period. . . . F Colton Veloso (2) made it 1-0 at 5:35, with F Ryan Hughes (2) counting at 7:18 and F Alex Overhardt (1) upping the lead to 3-0, on a PP, at 11:58. . . . The Cougars got on the scoreboard when F Kody McDonald (2) scored at 6:38 of the third period, seven seconds after the expiration of a PP. . . . The Winterhawks got that one back just 1:07 later as F Keegan Iverson got his third goal of the series. . . . F Colby McAuley (4) added a late PP goal for the Cougars, at 18:59. . . . G Cole Kehler stopped 35 shots for the Winterhawks and was saluted as the game’s first star. . . . The Cougars got 38 stops from G Ty Edmonds. . . . Prince George was 1-2 on the PP; Portland was 1-5. . . . Prince George had F Tanner Wishnowski back after he served a one-game suspension for becoming involved with a fan during Game 4 in Portland on Thursday. . . . The Cougars again were without F Brad Morrison, a 20-goal scorer who was unable to recover sufficiently from ankle woes to contribute. Morrison, who missed the last three games of the series, was injured in a fight on Feb. 24 and played in only two games after that. . . . Announced attendance: 4,211. 3, and will open the second round in Regina against the Pats on Thursday. . . . The Warriors had finished second in the East Division, five points ahead of the Broncos, who were 24 points behind the first-place Pats. . . . Last season, Papirny, now 20, backstopped the Brandon Wheat Kings to the Ed Chynoweth Cup. Last night, he stopped 14 shots in the first period, 11 in the second and 14 in the third. . . . Papirny, who will turn 21 on Monday, went 2.02 and .947 in the seven games. He now has played in 56 playoff games, going 37-19, 2.77, .916. A year ago with Brandon, he went 16-5, 2.93, .897. . . . Last night, The Broncos took a 2-0 lead on goals from D Colby Sissons (2), at 4:30 of the first period, and F Tyler Steenbergen (6), on a PP, at 1:47 of the second. . . . F Justin Almeida (2) got the Warriors to within a goal at 7:49. . . . F Glenn Gawdin (3) restored Swift Current’s two-goal lead at 3:17 of the third period. . . . D Josh Brook (2) made things interesting when he scored for Moose Jaw at 14:59. . . . The Broncos got two assists from D Max Lajoie, with Steenbergen adding one to his goal. . . . Brook had an assist for the Warriors. You can bet he’ll be added to the Canadian U-18 team that will leave on Wednesday for the IIHF World Championship in Slovakia. . . . The Warriors got 27 saves from G Zach Sawchenko. . . . The Broncos were 1-4 on the PP; the Warriors were 0-5. . . . Announced attendance: 4,585.